What do you really think about your toothpaste? Do you like it? Does it taste good? Does it work? Is it easy to use? Are these all weird questions? Yes. They are. The truth is, you probably don’t think too much about your toothpaste. You pick it up at the store, drop it next to the sink, slap it on your toothbrush and proceed to brush your teeth twice a day. Maybe you’re brand loyal. You always grab the same brand, but what about flavor or features? Beyond the minty flavor and maybe choosing something that promises to whiten your teeth, your toothpaste probably doesn’t engage you all that much. But what if it did? What if your toothpaste actually was a little different than the typical brands found in the oral care aisle of your local Walmart, Kroger or Target? You could have a completely different, more satisfying experience when you brush your teeth. All it takes is the right toothpaste. There are many, many brands of toothpaste on the market. Most of them contain fluoride, while some of them also contain baking soda, hydrogen peroxide and whitening agents. In general, they do what toothpaste is supposed to do. Is that really enough? Maybe it’s time your toothpaste went above and beyond the realm of standard toothpaste benefits. Although most toothpaste does what it’s supposed to do, maybe that’s not enough. To go beyond that, you need a different toothpaste to provide a unique experience and a special outcome. Have you ever heard the adage, “if you keep doing what you’ve always done, you’ll keep getting what you’ve always got.” Turns out it’s true. Even for toothpaste. You’ve got to try something new to get new results. You might think that premium toothpaste is simply toothpaste that is more expensive than the regular, well-known brands. While it might be true that premium toothpaste can cost more, you usually get more for your money. In fact, there’s one toothpaste now available that provides oral health and other benefits well beyond the standard fluoride-based features of typical toothpaste. Once you’ve tried it, you’ll never go back to your old brand again. So, why should you try a new premium toothpaste? Because not only does it do everything typical toothpaste does, but it also gets rid of the sulfur gas that is at the heart of a whole host of issues that oral health. If you don’t know much about sulfur gas in the mouth, keep reading. It’s actual science that much of the bad stuff that happens in your mouth like bleeding gums and even bad breath is a direct result of sulfur gas. That’s because there are naturally occurring bacteria in our mouth that consume protein particles from the food we’ve eaten. That’s all hunky dory, but it’s what happens next that’s the problem. When bacteria eat the protein, sulfur gas is produced as a byproduct – a stinky, smelly byproduct that wreaks havoc on your mouth. Even worse, sulfur gas thrives in the low oxygen environment inside our mouths, especially the subgingival area below the gum line where it’s hard to reach, and hard to get rid of. The good news is you can stop sulfur gas in its tracks with SmartMouth Premium Toothpaste with Zinc +2. 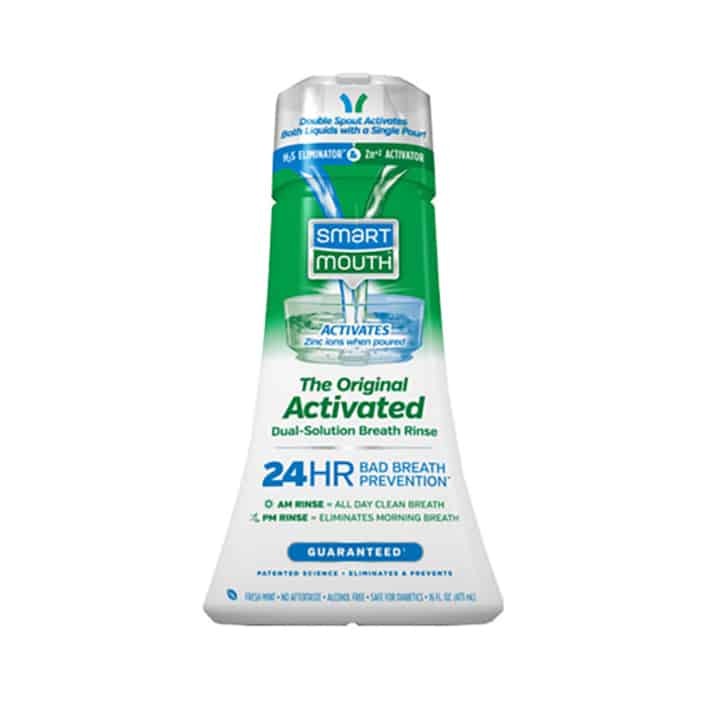 Premium Toothpaste is just the latest addition to the SmartMouth line of premium oral care products. 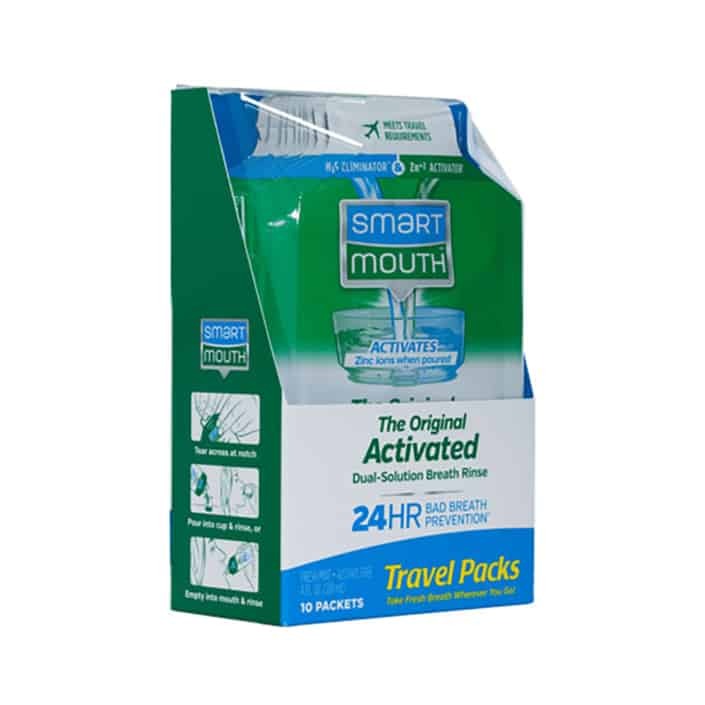 SmartMouth Oral Rinses feature patented zinc ion technology that prevents bacteria from releasing sulfur gas for 24 hours per rinse*. Not only does this minimize the damage the sulfur gas could have on the tissue in our mouths, but it also gets rid of bad breath all day long. And all thanks to the power of zinc ions. Zinc ions (Zinc +2) block the formation of sulfur gas, including subgingivally. Freshens breath much more effectively than the taste-masking approach taken by most other brands. Features a pleasant light mint flavor with no aftertaste. Clinically developed by dentists and used exclusively in dental offices for many years. 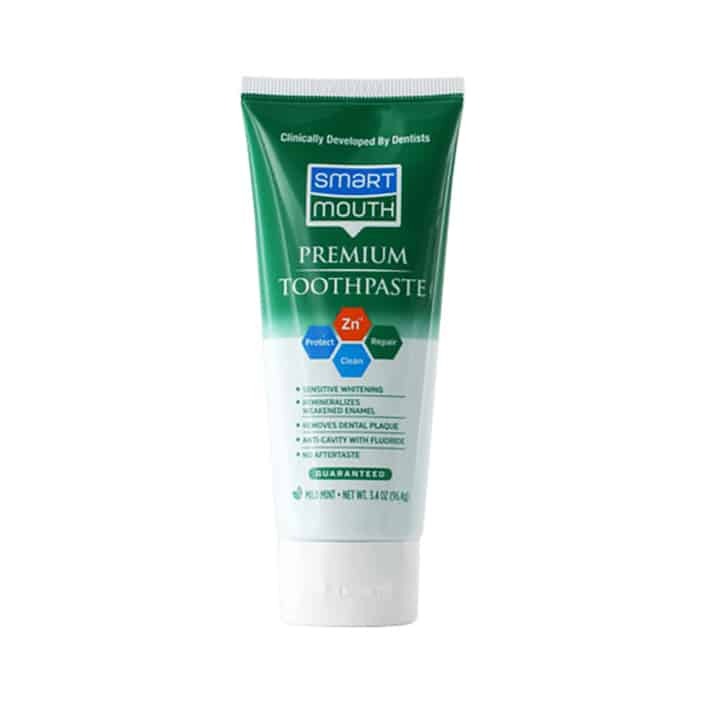 With so many great benefits, SmartMouth Premium Toothpaste is the perfect supplement to SmartMouth Oral Rinses. Not only can you have healthy teeth and gums and fresh breath, but you’ll love the experience of brushing with it. In test after test, real users have raved about the great feeling they get from using SmartMouth Premium Toothpaste. Many love the light, minty flavor. Others like the clean, fresh oxygenating bubbles. It really does provide a new kind of feel and a smart kind of clean. Add some zip to your tooth brushing routine with SmartMouth Premium Toothpaste. You can pick some up at most Walmart and Walgreens stores or online at Amazon. To learn more, visit How It Works, like us on Facebook and follow us on Twitter.